Sometimes, studio projects really makes the difference in terms of Metal, creating good music to our ears, but some are too special that really bring tears to our eyes of pure emotion. 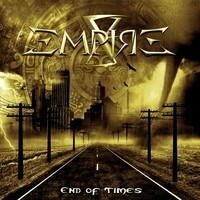 And Brazilian quartet X-EMPIRE shows to be a band that can satisfy both Greek and Trojans in terms of Metal. And listening “End of Times”, their first EP, makes the thing clear. The quartet is a side project from Michel Marcos (owner of M&H studios and musical producer), Rogério Oliveira (from CHIMAERA and owner of Flight Studios) and Raphael Jorge (drummer for Prog Metal band HEPTAH and ABSTRACT SHADOWS), but here, it’s very different from what they’re used to do. It’s a modern Metal way, something new, between the brutality and melody, sounding like a personal mix of ICED EARTH with JUDAS PRIEST, but taking some elements from names like ARCH ENEMY, SOILWORK, IN FLAMES and others more modern bands. And no, Ol’ Big Daddy here is not joking: their music is very fresh, and full of life and energy, marrying perfectly guttural grunts and clean vocals, oppressive and melodic riffs, technical and heavy rhythmic basis, with some elegant aspects. The sound production is a perfect work done by Michel Marcos and Rogério Oliveira on M&H and Flight studios, so it’s clean, intense and heavy, without tearing out the aggressiveness. So be prepared to be hit by a musical work done with quality and brutality at the very same time and doses. Best moments: “WarCry” with its heavy and aggressive grasp (great vocals and drums, as well as intense guitar riffs), the beautiful and warm “No Answers” (a power and heavy ballad, full of emotion and great vocals duets), and “End of Times”. It’s an EP, so, the other songs are good as these ones. And the band promises that more are coming, a Full Length is being recorded and will be released soon.